Tell us what it's been like since leaving. It's been fine. I have missed a few events but people call or text me with news now. Those who don't, I know we are different friend levels. I am able to come up with more in depth discussions with people now because I don't know what they have been doing via pictures. Sometimes I feel disconnected but then I just pick up a book or my work and get over it. What other social media do you still use, and what have you left? I rarely use Twitter, Pinterest and Google+. I use them mostly as a means to store information for my job and to network. I do use Instagram and Snapchat daily, but never for more than 30 minutes total. I reach out to people frequently with texts or phone calls, then organize times to hang out. This is pretty similar but I am forcing myself to make phone calls and texts more often to simply ask someone what is new. This has been hard but great, because I do love my me time. What would you say to someone who's considering leaving FB? I would recommend trying it and to commit to trying to leave it. I enjoy it. Facebook has changed a lot since it was first released. Do you have any predictions about what it'll become in the future? I really feel like I eventually will have to get it again. I wonder if it will be the sole means of communication someday, so it might be like living without a phone. 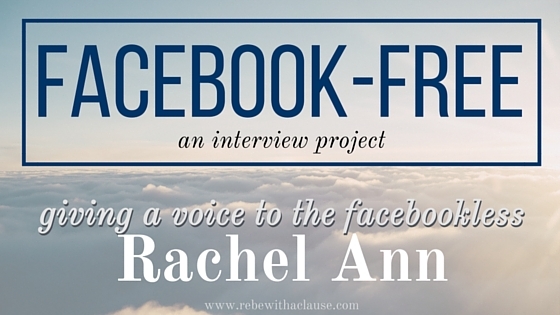 Thank you so much for taking the time to share your experiences with us, Rachel! Have you or has someone you know left Facebook? I'd love to feature you here! Please get in touch with me: @rebewithaclause or rebewithaclause [at] gmail [dot] com. Awesome. I deactivated my account a couple weeks ago. On the road to a full deletion... Thanks, Rebe and Rachel! Very cool! I'll be curious to find out what you think so far.